Crash! Boom! was featured prominently on the ‘New Releases’ shelf at the library this week. As soon as I saw “A Math Tale” on the cover, I knew I had to check it out. I’m always thrilled to see math-related picture books because they can greatly enhance STEM learning during everyday reading experiences. Plus, many education scholars have noticed that when math concepts are embedded within picture books, children learn more about broad math themes and can better recall and retain new math knowledge. 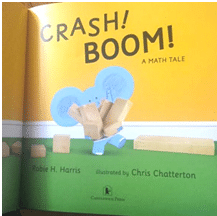 Not only was I happy to see that this book was math-themed, but also that it featured blocks. Blocks are one of the best tools for children to use to learn new math and engineering concepts. Blocks allow kids to design, experiment, make predictions, and execute plans for building different structures. Plus, when children are taught math skills like counting and sorting within their own playtime (as is possible during block play), numbers become much more meaningful and substantial to them. 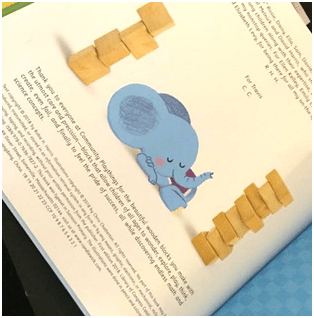 I thought designing the book in this manner was very smart; so many young children have used blocks like this, whether in a preschool classroom, at the library, or within their own homes. Seeing a character in a book using the same materials they’ve used before is a great way to give children a deeper connection to the story. The book presents minimal text, so it’s a great option for toddlers or emerging readers. 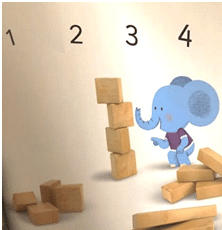 The story follows a small elephant as he goes through the stages of creating structures with his wooden blocks: First, he wants to build a tower as tall as he is, so he counts out the blocks. But when the tower falls, he has to experiment with a new way of creating his tower so it’s more stable. The book is a great way to introduce young children to the processes of experimentation, testing, and modification within the design process. Numbers are featured prominently as a part of the text; even if a child can’t read yet, he or she can recite the numbers and count along throughout the book. There are also many opportunities for fun, interactive reading throughout this story. 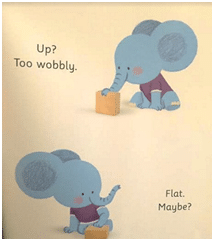 My 5 year old and I used silly “elephant voices” as we read. She also cracked up as the elephant laughed, cried, danced, and bumped the blocks. 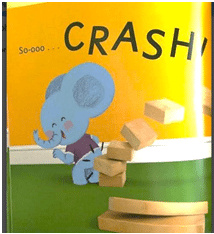 In addition to the great math and STEM content this book provides, I think it also teaches children important lessons about perseverance and persistence in an amusing manner. It’s important for kids to see characters try new ways of accomplishing a task, problem solve, overcome unexpected challenges, and not give up. 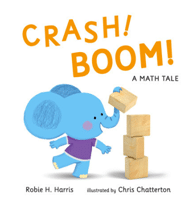 This book communicates these ideas, and an assortment of math-themed content, but in a way that’s bright, charming, stimulating, and just plain fun! 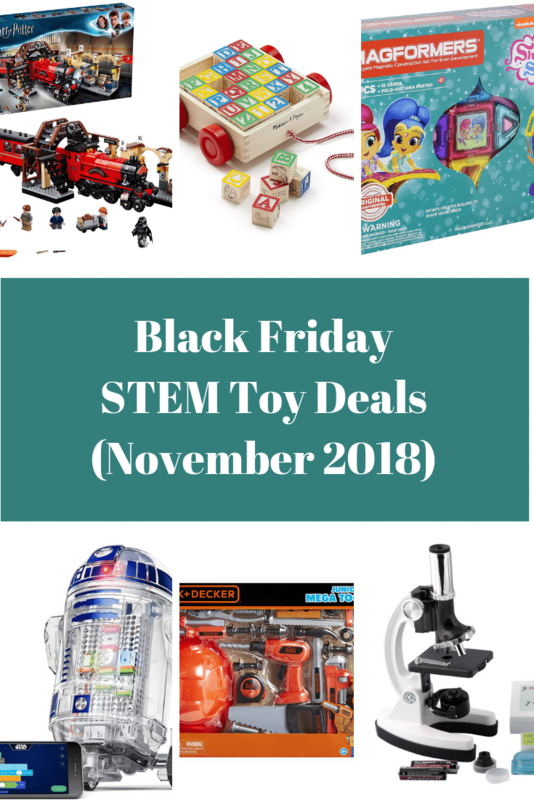 Check it out with your toddler to kindergarten-aged child…and then try building your own tower together!